Finally, the first weekend in May, the day came for me and Sebastian to attend our first competitive trail ride together. 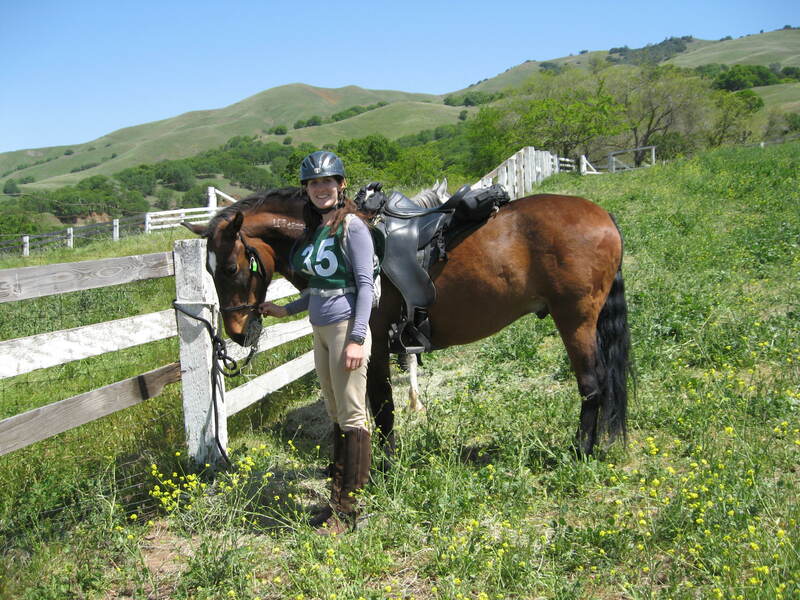 NATRC rides are long trail rides where the horse is judged on soundness, fitness and trail ability while the rider is judged on everything having to do with safe horse camping, horsemanship and good riding. It is the perfect sport for me and Sebastian for lots of reasons: it gives us a goal to work towards to keep him fit, it is something we can easily practice right from our house, it gives me an excuse to resurrect long lost grooming practices (like french braiding tails) from my teenage show days, Sebastian’s generally calm temperament gives us a fighting chance of completing these rides without serious bodily harm, and the folks at rides are so darn nice and welcoming. This is not the “A” circuit Hunter/Jumper world I was raised in. The packing for these rides is really something. You would think we were going to the moon! Here is O, supervising the proceedings. My friend Jill was good enough to save us a spot out at Mt. Diablo, so although I left late after tending to a zillion unexpected details I was able to camp right next to Jill and her neighbor Val. The first order of business at the ride was checking in and presenting Sebastian to the vet to be sure he was sound and ready for the ride. Sebastian was very well mannered for the vet. It called upon one of his most practiced skills- standing still. 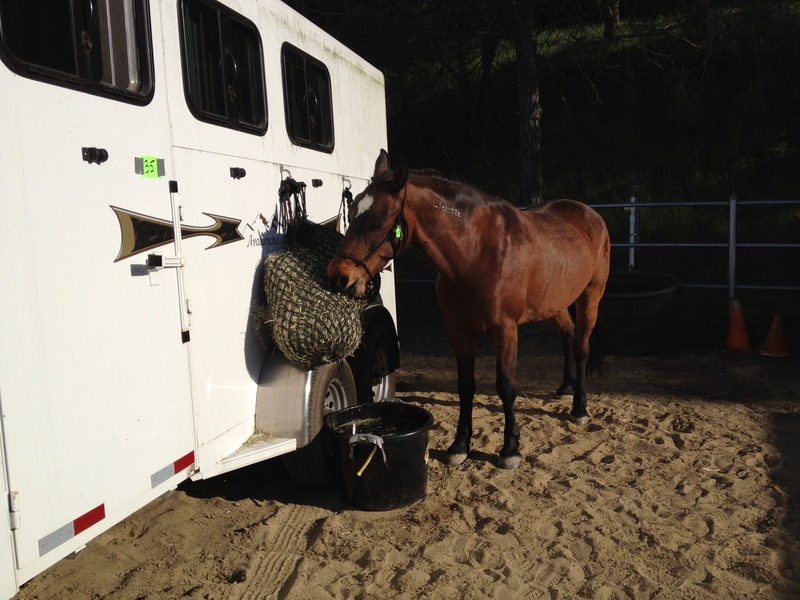 By contrast, at Annie’s first ride she unloaded from the trailer and immediately went into raging heat. She would spread her legs, throw her tail to the side and shoot urine when any creature got near her hindquarters. Any creature including the vet. So already I was finding this experience with Sebastian more relaxing. This would be Sebastian’s first night tied to a trailer, so I wasn’t sure what to expect. Annie’s first night tied to a trailer she paced alllllllll night long, rasping the metal clip on her lead rope on the back corner of the trailer with every pass and rattling the metal of her bucket handle against the side of the trailer occasionally for good measure. All the while I was attempting to sleep in the gooseneck of the trailer. Both of us did that Round Valley NATRC ride on zero hours of sleep. This time with Sebastian I thought I was a little smarter with my camp set up- at least set up to avoid any metal on metal. Of course with Annie the trouble would be constant movement, with Sebastian the lack of sleep ended up being caused by something he likes to do best. He would grab the small mesh hay net with his teeth and really have at it, rocking the entire trailer and causing a moderately loud WHOMP every time the net was pulled out and flopped back onto the trailer. As it was slightly less grating than metal on metal, I think we may have gotten a few hours of sleep between chow sessions. Sebastian started the morning a little excited, but it was nothing compared to the bouncing agitation of my companions’ horses. Jill’s horse Pokani has been just excellent at rides in the past, a total gentleman. That day he was just not having it, making Jill ride every step of the 22 miles to keep them both safe and within the timing of the ride (the rides are not races, you are required to complete within a window of the ideal time- going too fast is not acceptable). Val’s horse Jac had not been on an outing like this for a long time and was felling quite full of himself as well. Fortunately both riders were excellent and had many skills to handle the situation. All three of us train with Susan Dockter of Proactive Horsemanship, so it was nice to be in a crowd of riders handling difficult situations with good natural horsemanship skills. 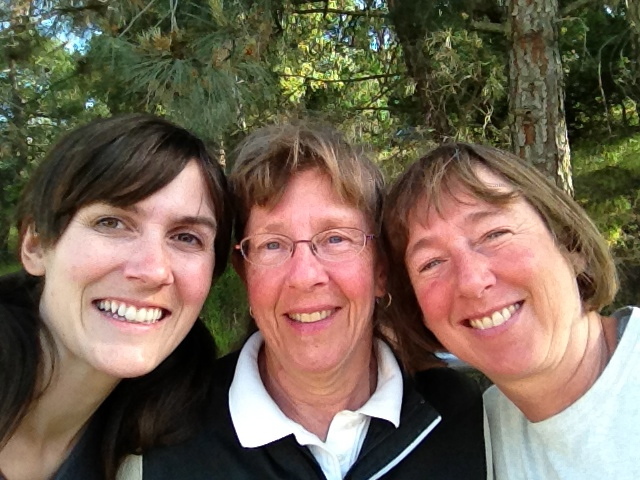 Me, Jill, Val. Pre-ride and feeling fresh. Not as fresh as some of our horses, however. Throughout, Sebastian was sort of an island of calm in a river of horse friskiness. I was so proud of him because these types of horse emotions are very contagious, especially when you’re on an inexperienced horse. Could be that Sebastian thought it would just be too much energy to waste. Eventually Jac and Val split off in order to cut down on the amount of concentrated naughty pony energy. Later we absorbed Sara and Tuscany, whose ride partners Barbara and Smokey had had to cancel at the last minute. They were a great addition- Sara was excellent company and Tuscany set a good pace with his giant walk. As a 22 year old horse, Tuscany was all business and did his job very well. The ride was not too hot, but very up and down. It highlighted my ever present desire for the Big Walk. Uphill and on the flat Sebastian can hustle up to the big walking horses with a little trot (I know, I know. I need to make him walk bigger and not let him trot. We will get there!) On the long downhills, however, this was not as doable. Of course he would be ambling along, unconcerned that his buddies were walking farther and farther away from him until their butts would go out of sight around a corner. Only then would the urgency register- Crisis! Trot down this ridiculously steep grade! The lions will eat me if I am left alone in this wilderness! Whinnies of desperation and tense, quick steps would follow until the butts were again within view and the casual ambling would resume. At the lunch break we walked though the mine field of small animal dens to reach the water trough at the top of this gorgeous pasture and found just across the fence the exact spot where my friends Jasper and Suzanne were married last year! Small world of beautiful places in the East Bay. Here we are after some refreshments. Sebastian still had not shed out his slimming stars- the pattern I shaved onto his hindquarters last fall when he had gotten so fat that I felt sad and guilty every time I looked at him. Having the stars to distract me as I got him into shape was very helpful, if not actually slimming in the traditional sense. This next picture is of Jill and the lovely Pokani. Jill was doing a great job on this ride. Pokani lives at Jill’s ranch, horse heaven on earth. With something like 500 acres of hills to play on, he has an incredible base of fitness. When he feels lively there is only small hope of physical tiredness helping a gal out. The vet checks and judged obstacles along the trail went great. I had been unsure of Sebastian’s fitness since this was our first go, but pleased to see that his pulse and respirations dropped right down at each vet check. At the end of the day we were both tired and happy to rest. Sebastian tucked into his hay and I sort of wandered around in a daze, grooming him up for the final vet inspection. I was worried he would be a super slug at the final trot out (you jog your horse out in hand, then have them travel a circle around you both ways, then jog back together to check for soundness) but he managed to get up to average speed with some brisk encouragement. At the awards ceremony we had a delicious tri-tip dinner. Consequently, I nearly passed out on the table during the raffle portion of the evening. In the end Sebastian won his class with 99 out of 100 points on his vet card! I was already over the moon, then I found out that he also won the Sweepstakes prize (meaning that he had the highest score out of all the Novice horses in each of the 3 divisions). I was so happy I was in tears! They somehow managed to print and frame this big picture of us climbing a steep hill in a pose not unlike the rider and horse on the NATRC logo. Very cool prize! Pretty darn good for my little range Mustang. 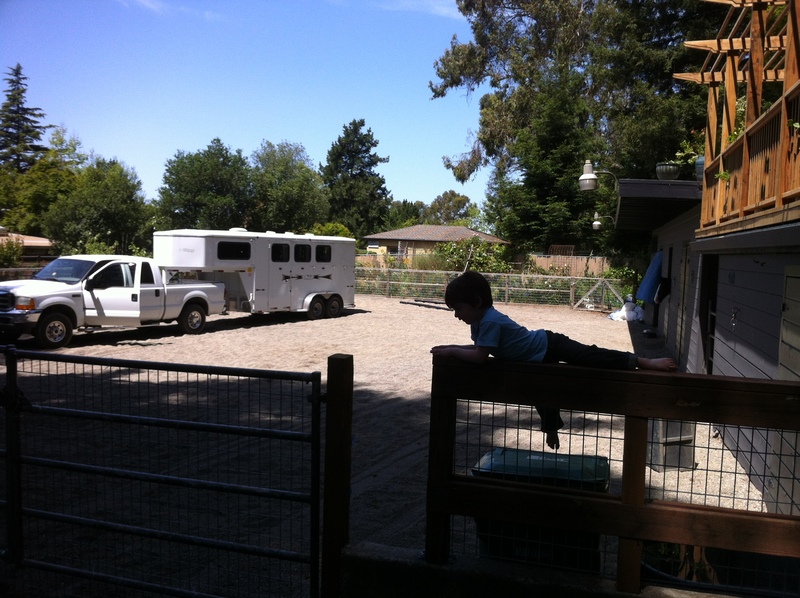 That night we both slept hard, with Sebastian even lying down while tied to the trailer- pretty advanced camping pony maneuver. By morning I was already planning our next ride! 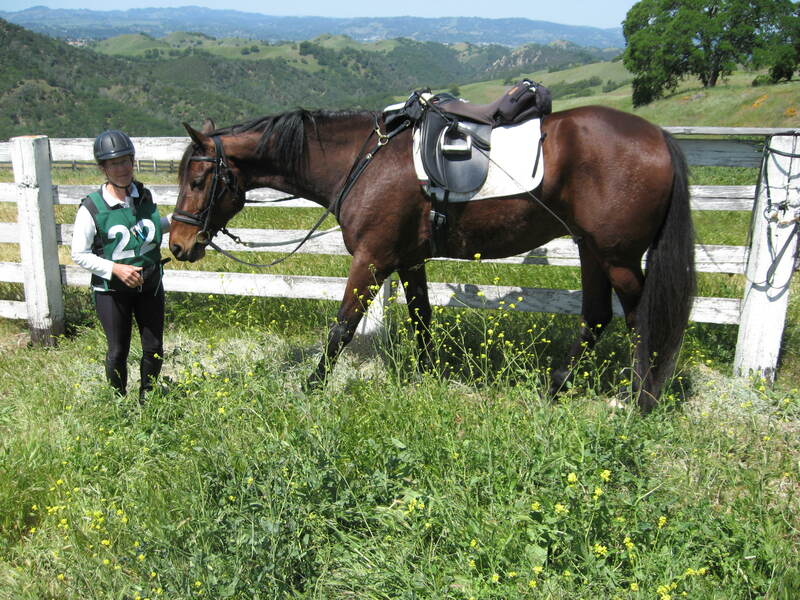 This entry was posted in Horses and tagged competitive trail riding, horses, NATRC, natural horsemanship on June 6, 2012 by fullheartsfarm.